Are you interested in enhancing your business processes? If yes, then it is time for the transition. And, in case you are struggling with your Magento regarding either speed or massive third party add-ons, then you should go ahead with the up-gradation process. Sometimes Magento services are outdated and thus they give poor performance. In place of migration the better option is Magento 2. It is faster than migrate and retains all the present features in the lowest possible price and time. WHY SHOULD ONE SHIFT TO MAGENTO 2? Magento 2 has new functions and great improved features like: inbuilt full page caching and minimized table locking. Magento 2 has become 20% more powerful because of its new up graduation as compared to Magneto. If you switch on to Magento 2 the checkout process and loading time of the catalogue of your online store will be twice faster than the one earlier. Along with faster loading it also tells you about the level of traffic that you might get at the time of a promotional offer or on a busiest day. Magento 2 is in league with a lot of other platforms which are very well known around. Your online store will be able to manage huge amount of traffic at the time of promotions or during peak hours. 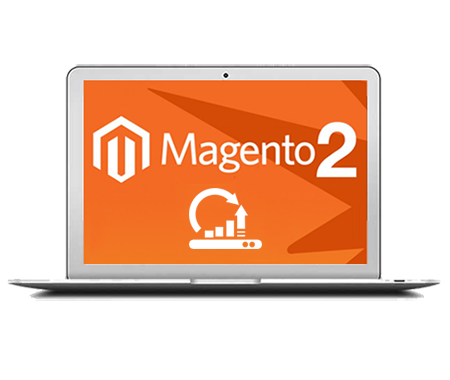 If you are unhappy with your present Magento installation then Magento 2 will make your work easier with less time and energy. With Magento 2 you will be able to explore the new organized Magento connect facilities. You can give better services to your website users with smooth experience and faster speed. You can add new features of your choice with the new upgraded version of Magento 2 . Magento 2 provides touch friendly admin panel. With Magento 2 you can get quick marketing in reduced cost. Magento 2 provides custom theme development. Magento 2 provides improvised layout for better excess. Magento 2 has varnish 4 support system. Magento 2 helps to improve your database. Magento 2 has easy customization thus giving improved performance. Magento 2 has customized admin panel. Magento 2 has full page caching and is very easy to install.